We all seek comfort when it comes to dressing up, and this combination of an Acne Studios nash face tee and white ripped skinny jeans is a good illustration of that. Complete this outfit with black and white suede low top sneakers. Pair an Acne Studios nash face tee with black ripped skinny jeans if you're hunting for an outfit idea for when you want to look casually cool. Wearing a pair of black suede loafers is an easy way to add extra flair to your outfit. If you're scouting for a casual yet stylish ensemble, try pairing a charcoal crew-neck t-shirt with blue skinny jeans. Both garments are totally comfy and will look fabulous paired together. Lift up your ensemble with black suede ankle boots. If you're looking for a casual yet totally chic outfit, go for an Acne Studios nash face tee from Nordstrom and black denim shorts. Both pieces are totally comfy and will look fabulous paired together. If you're hunting for a casual yet totally stylish look, pair an Acne Studios nash face tee with blue skinny jeans. Both items are totally comfy and will look fabulous paired together. When it comes to footwear, this ensemble is complemented well with grey snake leather wedge sandals. If you're on the lookout for a casual yet absolutely chic look, pair an Acne Studios nash face tee with black skinny jeans. Both garments are totally comfy and will look fabulous paired together. When it comes to footwear, this outfit is finished off really well with black leather lace-up flat boots. If you're a fan of practicality dressing when it comes to your personal style, you'll love this absolutely chic pairing of an Acne Studios nash face tee from Nordstrom and blue ripped skinny jeans. When it comes to shoes, this outfit is round off wonderfully with black leather slip-on sneakers. 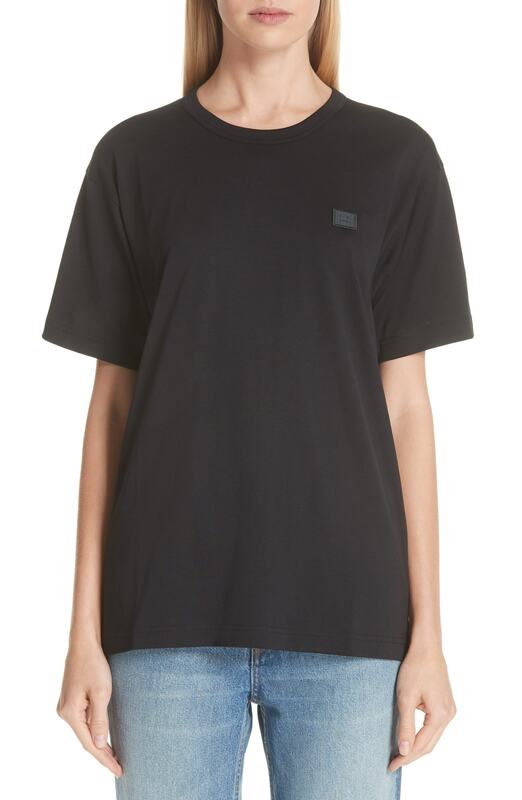 If you're searching for a casual yet stylish getup, marry an Acne Studios nash face tee with blue skinny jeans. Both garments are totally comfy and will look fabulous together. Take your look into a more casual direction with tan uggs. If you're in search of a casual yet chic look, wear an Acne Studios nash face tee with a light blue midi skirt. Both garments are totally comfy and will look fabulous paired together. For something more on the daring side to complete this getup, make black leather lace-up flat boots your footwear choice.